Revolution Trains is offering the attractive GWR/BR(W) 56XX 0-6-2 tank engine as its first steam locomotive. This model is being produced in conjunction with new entrant Sonic Models, and will feature high levels of detailing and a smooth reliable running. Though the engineer behind the model has a track record of producing highly regarded steam locomotive models in N, the 56XX has been selected in part because it does not feature complex outside valve gear. 200 of the attractive 56XX locomotives were built at Swindon (with a small number built in the North East due to capacity issues) and designer C B Collett borrowed heavily from the proven south Wales valleys engines inherited by the GWR. The locomotives were reliable and sturdy and while originally intended for traffic in south Wales they rapidly saw service across the GWR, and subsequently the western region of British Railways, from the South West to the Midlands. All were withdrawn by the end of 1965, and nine are now preserved. 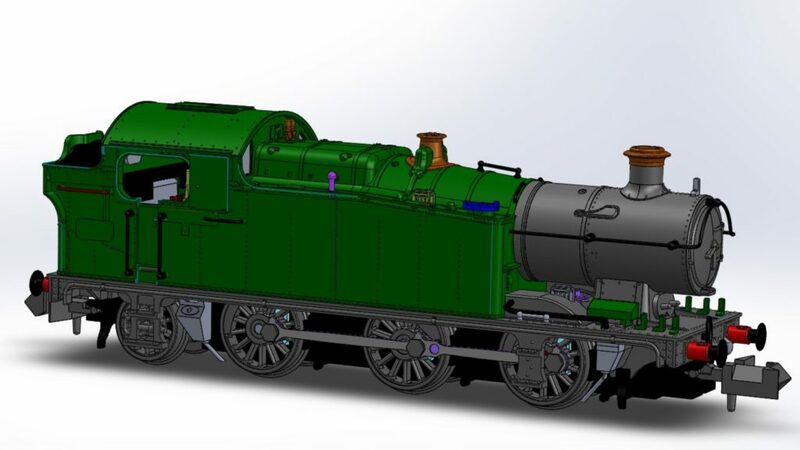 The models will be available in GWR green, BR green and BR black, and will feature coreless motors, NEM 6 pin decoder socket, NEM couplers, original or later style driving wheel balance weights, Swindon or Armstrong (NE) safety valves, detailed cab interior and accessory detail pack. Delivery is expected Q4 2019. CAD for this model has now been approved and an image is attached. Like the VEA van produced by Sonic models, this product is not being crowdfunded but sold via retailers in the traditional way.